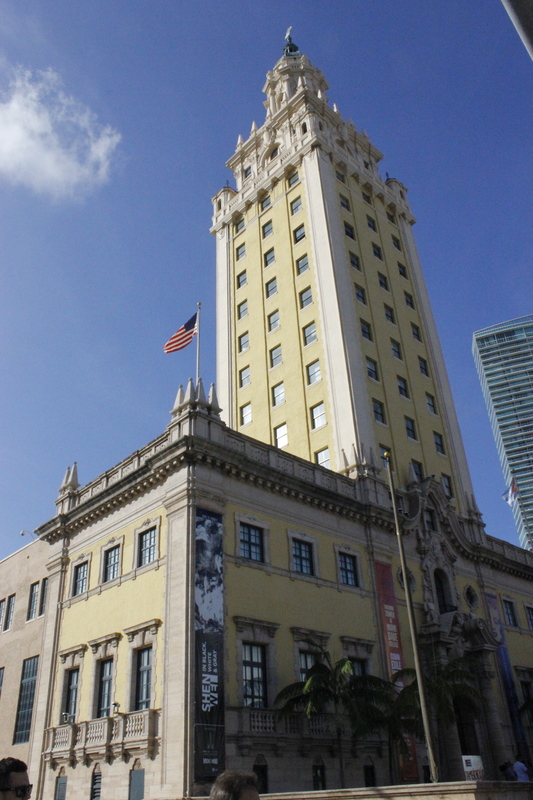 In front of the Freedom Tower, a Miami landmark known for its role as a point of entrance for Cuban exiles, a crowd gathered on December 30, 2014. 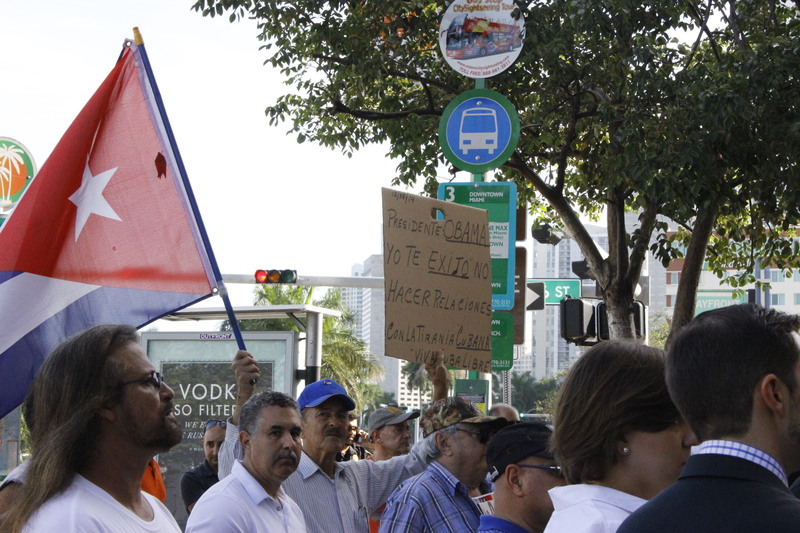 The small yet passionate group, composed almost entirely of Cuban activists and members of the Cuban exile community, wielded Cuban flags and posters demanding an end to the Castro regime. International attention has shifted to Cuba since the historic announcements by Presidents Barack Obama and Raúl Castro on December 17 revealed plans for reestablishing U.S.-Cuba diplomatic ties after more than fifty years of Cold War tensions. After months of secret negotiations between the United States and Cuban governments, the announcement left many Cubans and Cuban-Americans feeling omitted from the process. 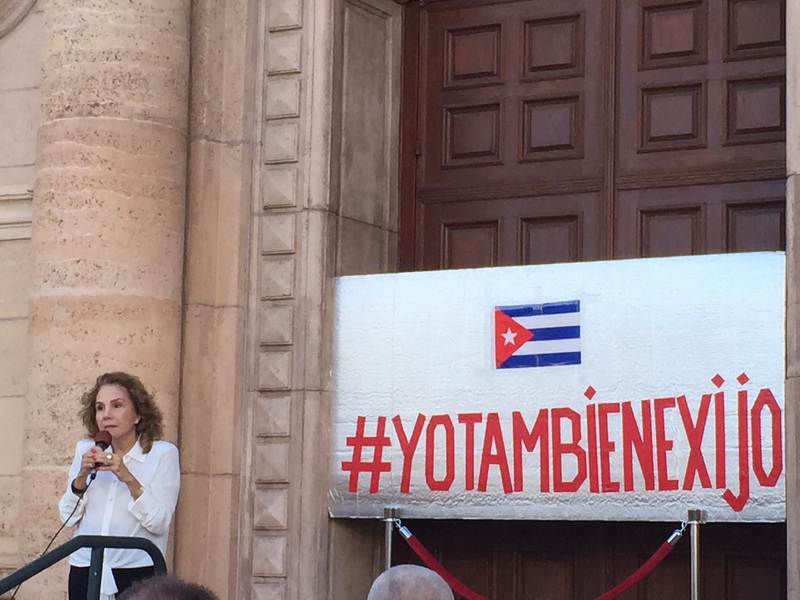 In response, Cuban activists began a social media campaign with the slogan #YoTambienExijo (IAlsoDemand) to give a voice to citizens who were not included in the private dialogue between those in power. The movement, which has gained some traction on Twitter, seeks to provide a forum for Cubans to express their opinions and state their demands for the future of U.S.-Cuba relations. 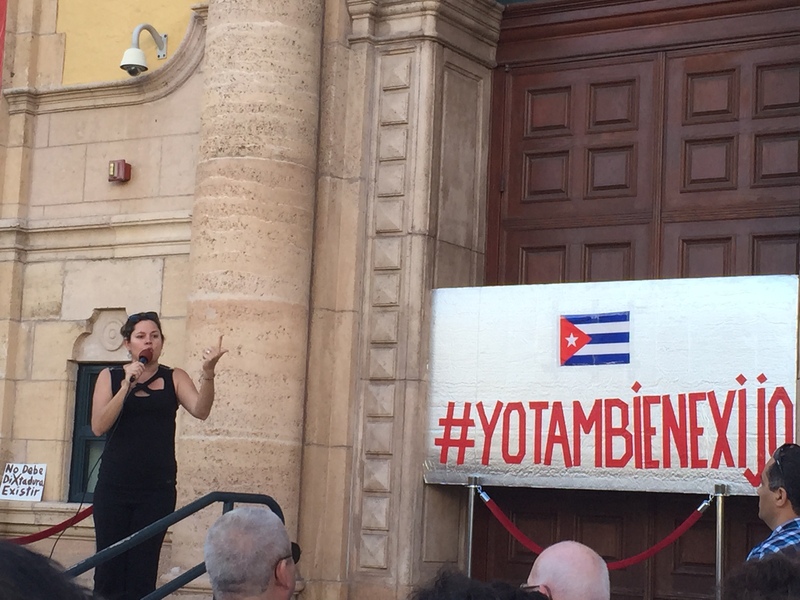 The #YoTambienExijo campaign inspired performance artist Tania Bruguera to organize a public rally in Havana’s Plaza de la Revolución. 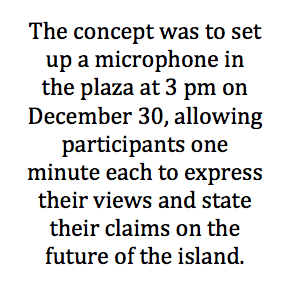 The concept was to set up a microphone in the plaza at 3 pm on December 30, allowing participants one minute each to express their views and state their claims on the future of the island. Bruguera made her way to Cuba on December 26 to finalize arrangements for the public rally, but Cuban authorities withheld approval for Bruguera to hold the event, calling it a political provocation rather than an artistic work. In spite of this, Bruguera said the performance would continue as planned. But, leading up to the planned demonstration, Cuban authorities attempted to prevent activists, journalists and would-be demonstrators from expressing their thoughts by arresting and detaining various dissidents. 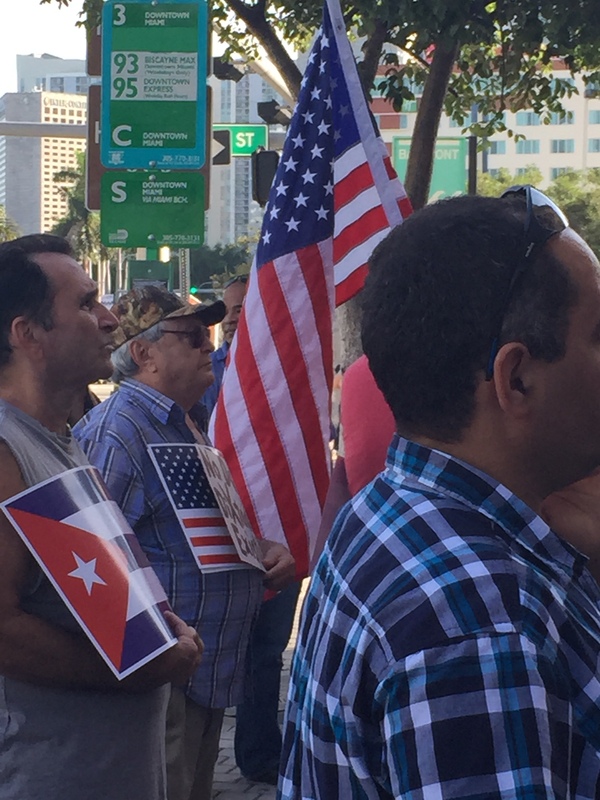 Cuban exiles, inspired by Bruguera’s event, organized for a simultaneous rally to be held in downtown Miami. 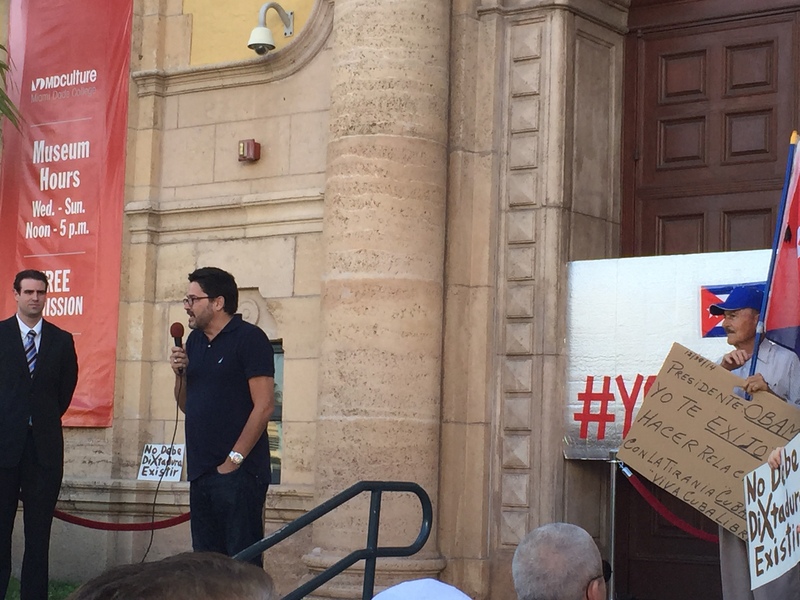 While the rally in Havana was prevented from taking place, the Miami event went on as planned. Among the Miami organizers was Rosa María Payá, daughter of Cuban dissident Oswaldo Payá who died under suspicious circumstances in 2012. Payá argues the negotiations between the governments of the U.S. and Cuba have excluded the Cuban people. 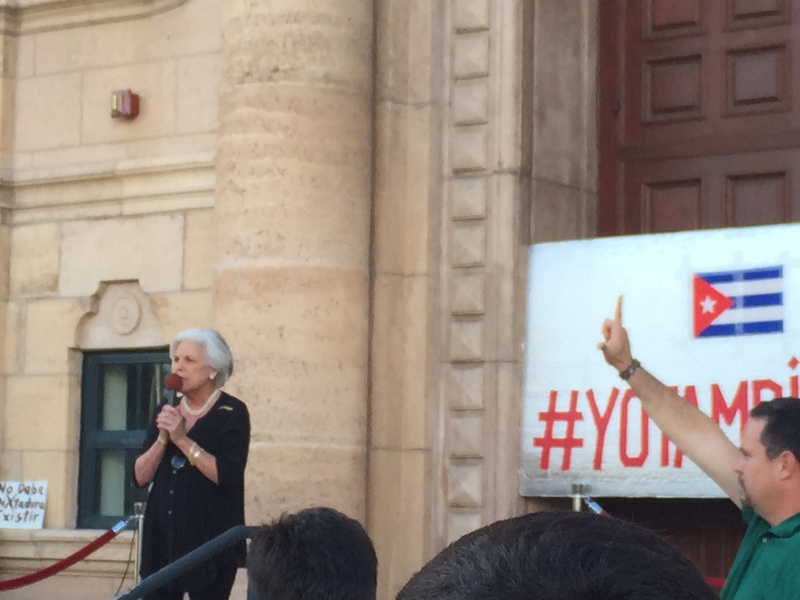 She viewed the rally as an opportunity to give voice to those who had been silenced in Cuba. 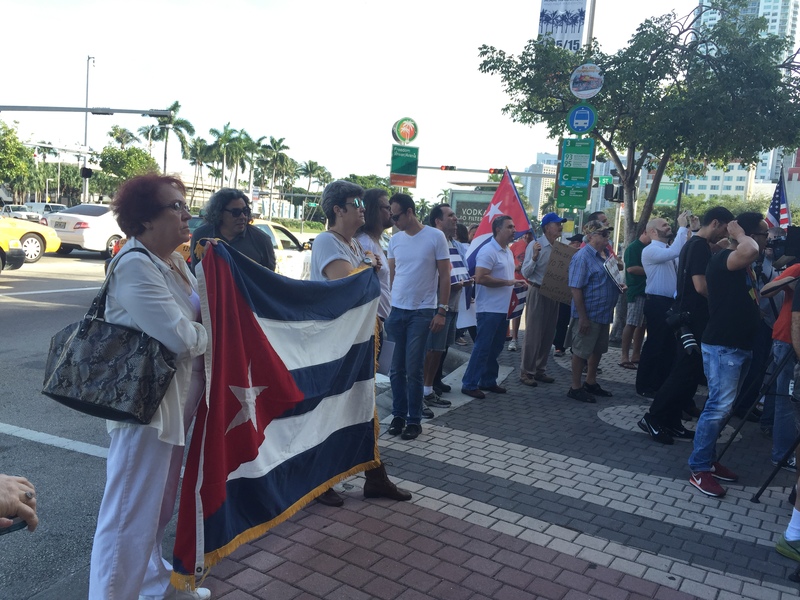 Among those who took their minute at the microphone in Miami, the consensus was that an end to dictatorship in Cuba is necessary. 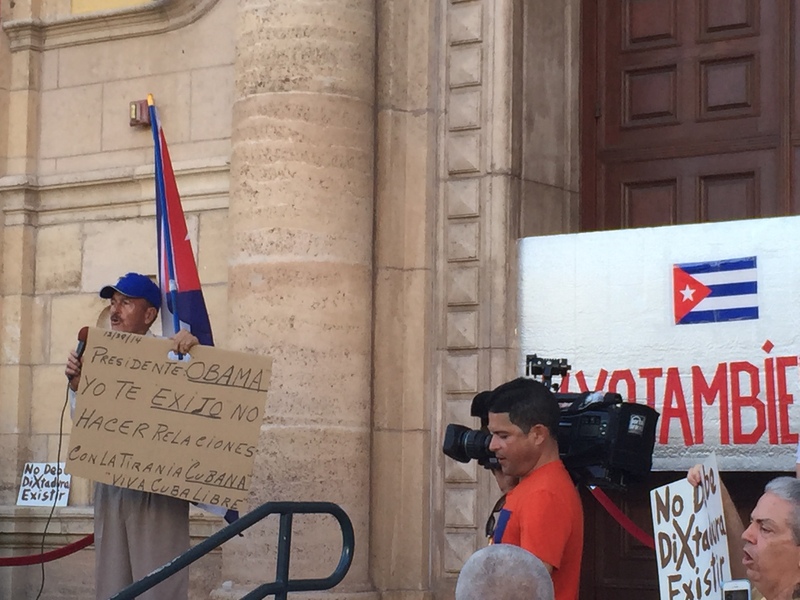 Many rally goers pleaded for negotiations to be withheld until after the Castro administration is dissolved. Emotionally stirring accounts conjured images of political prisoners unjustly detained by Cuban authorities, an occurrence taking place at that very moment on the island. Others called on the crowd to remember the Cuban migrants who have died at sea on shoddy rafts while attempting to make their way to the United States. 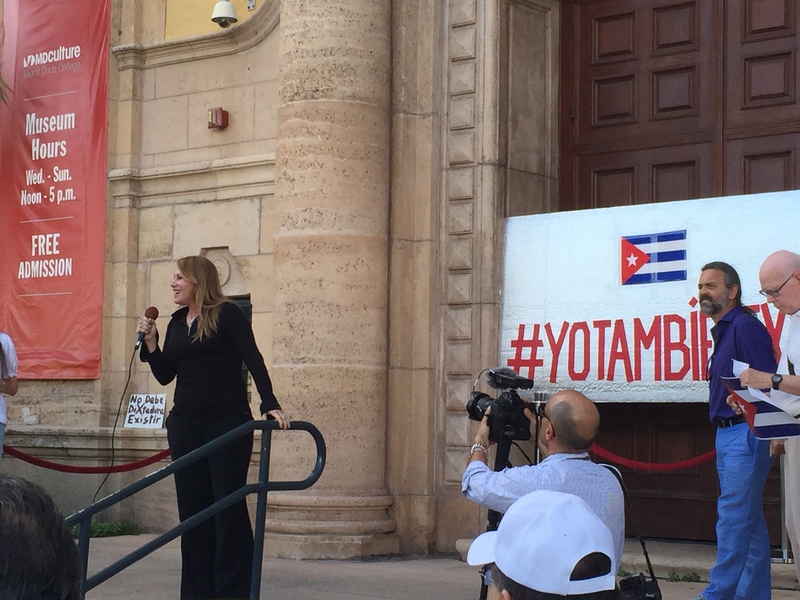 Many of those who took to the mic in Miami have directly experienced repression at the hand of the Castros. Orlando Luis Pardo Lazo, a prominent Cuban writer, photographer and the current International Writers Project fellow at Brown University, denounced the Cuban government’s unjust detainment of independent journalists and bloggers who were not involved in planning the event in Havana. 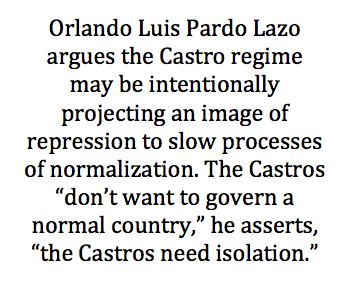 In a telephone interview I conducted with Pardo Lazo after the rally, he said he’s skeptical of the United States’ hopefulness for normalization with Cuba. He recalls the Castro administration’s history of creating crises at times of negotiation with the United States, such as the migration crisis created by the 1980 Mariel Boat Lift during negotiations with President Jimmy Carter. 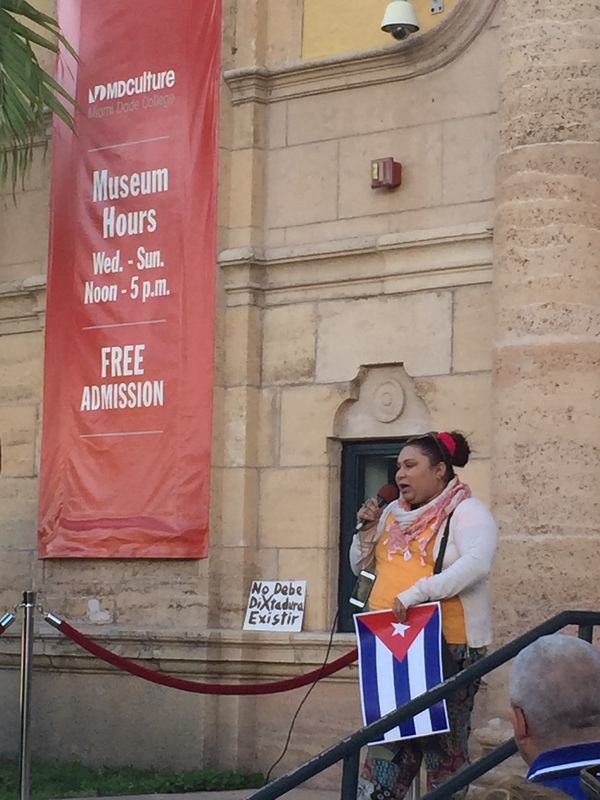 This passion was shared by others who called for an “independent, democratic Cuba” free from the Castro dictatorship. One Cuban-American man referenced a conversation with a relative in Cuba who told him, “Quiero ser tratado como un ser humano” (“I want to be treated like a human being”). 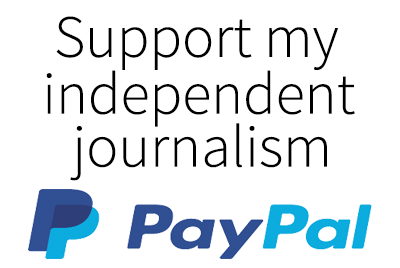 Rey Anthony Lastre, an eighteen-year-old third generation Cuban-American journalist pleaded for Miami’s Cuban ex-pat community to not give up the fight for a dictatorship-free Cuba. 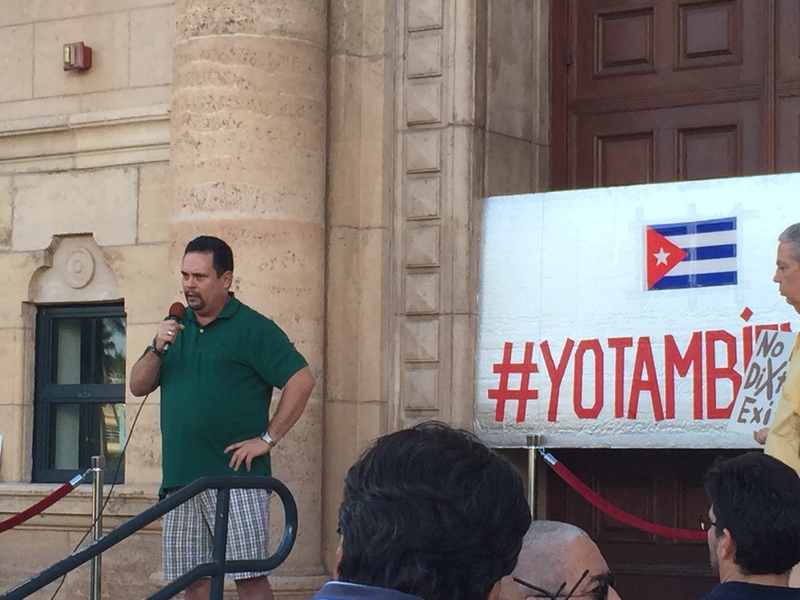 He asked that his grandparents’ struggle, as well as that of other Cuban immigrants, not be forgotten and urged for the younger generation of Cuban-Americans to become active in the #YoTambienExijo movement. 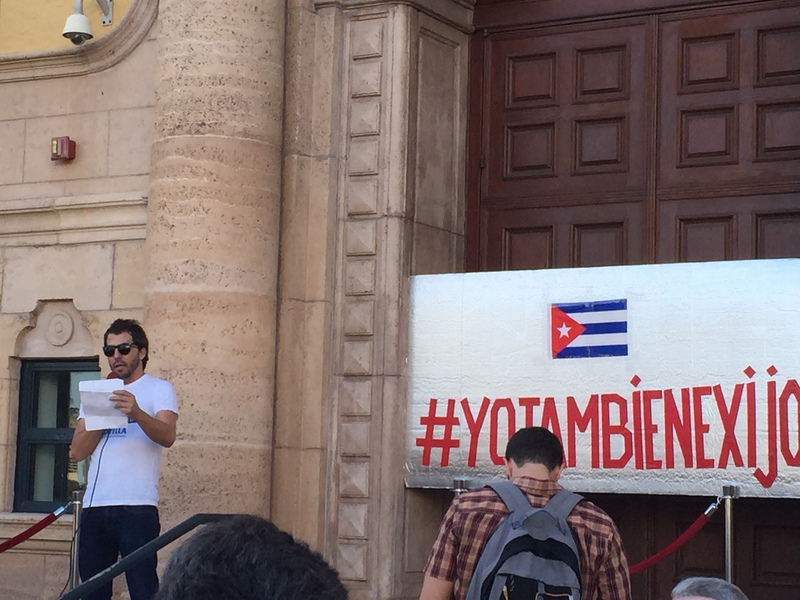 The Cuban government’s response to the planned #YoTambienExijo rally indicates the Castro government is pushing on with its recognizable repression of free speech. 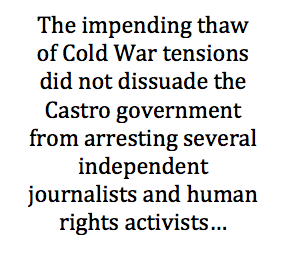 The impending thaw of Cold War tensions did not dissuade the Castro government from arresting several independent journalists and human rights activists by the afternoon of December 30 in an attempt to censor the opposition. Within a matter of four days, Bruguera has been arrested and released more than three times. Her passport has been confiscated and it is unclear whether or not the Cuban government will allow her to leave the island. If she does leave, it is unknown if Cuban authorities will ever allow her to reenter. In spite of these unsubstantiated political arrests and obvious abuses of power, the U.S. government’s response has not been powerful or direct. 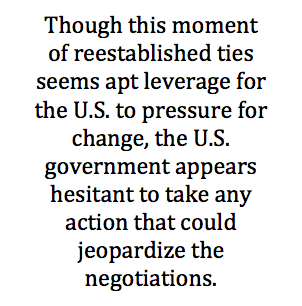 Though this moment of reestablished ties seems apt leverage for the U.S. to pressure for change, the U.S. government appears hesitant to take any action that could jeopardize the negotiations. The U.S. Department of State released a statement following the initial arrests in which they “strongly condemn the Cuban government’s continued harassment and repeated use of arbitrary detention, at times with violence, to silence critics, disrupt peaceful assembly and freedom expression, and intimidate citizens.” However, the declaration does not include any firm human rights conditions or consequences should Cuban authorities continue this repression. In Cuba, the mass arrests and silencing of “dissident” voices have once again revealed the Castro government’s intolerance of opposing views and calls to question the lack of a strong response from the United States. Moving forward with the normalization of diplomatic ties, it remains to be seen if the Obama administration will take these abuses into account. 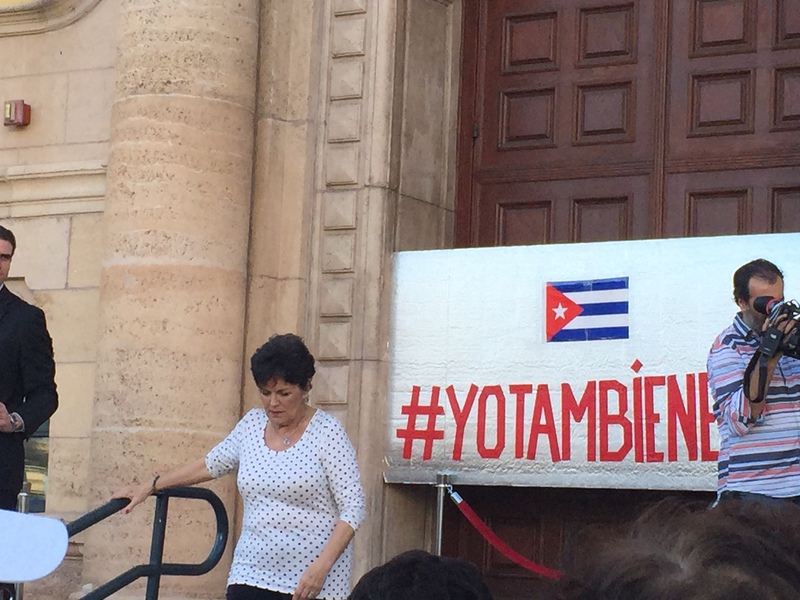 Though it is certain that Cubans, on and off the island, will continue to voice their demands.